The masters of modern and contemporary ceramics are brought together for a prestigious London sale. 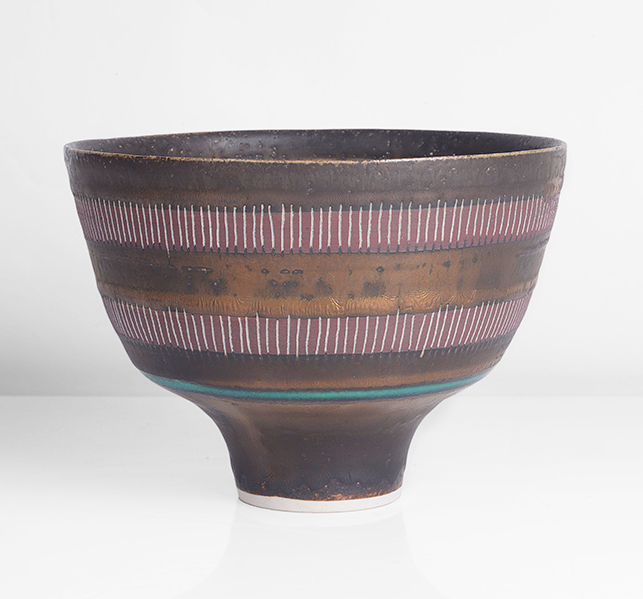 Hans Coper (1920-81) was an influential German-born British studio potter. He is known for his abstract but functional pieces that are largely sculptural. This sculptural aspect comes from the way Coper would throw his work on the potter’s wheel and then alter and assemble pieces by hand to achieve its finished form. From Maak's sale on November 22, this particular piece comes from a private collection in Japan. It is comprised of T-Material, layered white porcelain slips and dark manganese engobes over a textured body. The oval body is squeezed to an oval lip with a strong vertical indent front and back. 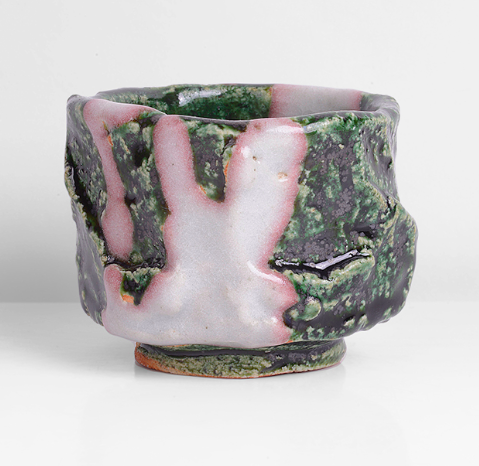 It is raised on a cylindrical foot with spiraling shadows beneath the glaze, impressed with an HC seal. Coper is often associated with Austrian-born British studio potter Lucie Rie DBE (1902-95) because in 1946, Coper was hired as Rie’s studio assistant. However, while Coper's work is sculptural and abstract, Rie's is polished perfection. Her work is known for its smooth surfaces, sleek edges and precise form. This is certainly true for this piece, a porcelain bowl on foot from 1980 with golden bronze glaze, two terracotta bands crossed with sgraffito and a turquoise ring in the well and around the foot. It hails from a private collection in South Africa. Alison Britton OBE (b. 1948) is a British ceramic artist known for her large, sculptural, slab built vessels. Her work can be found in a number of collections, including the Victoria and Albert Museum in London, the British Council Collection and Los Angeles County Museum of Art. 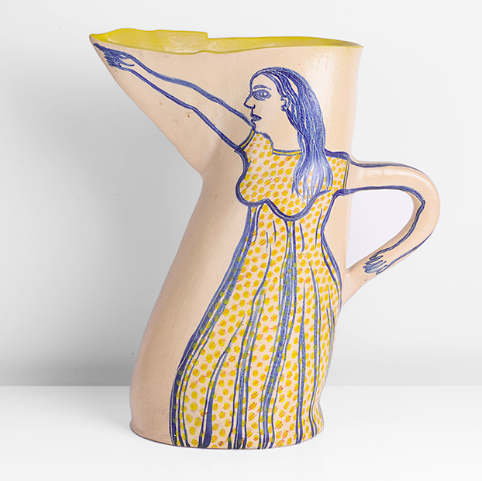 This early work from 1978 features a pale yellow glaze with blue and yellow painted figures on each side with incised detailing, a strong yellow glaze to the interior and incised signature. Its provenance is from a private collection in London, and it comes in perfect condition with no damage or restoration. Jennifer Lee is another prominent British sculptor. She was born in Aberdeenshire, Scotland, in 1956. From 1975 to 1979 she studied ceramics and tapestry at Edinburgh College of Art. She then spent eight months on a traveling scholarship to the United States where she researched southwestern Native American Indian prehistoric ceramics and visited contemporary West Coast potters. In June 2018, Lee won the prestigious Loewe Craft Prize with her hand-built ceramic vessel, Pale, Shadowed Speckled Traces, Fading Ellipse, Bronze Specks, Tilted Shelf (2017). 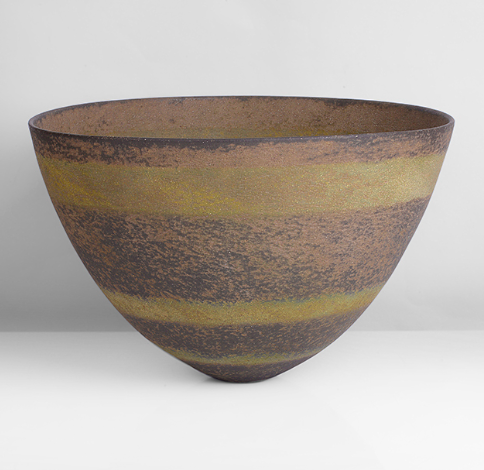 Here is a large stoneware bowl from 1989, featuring a mottled dark green body with three integral olive green bands around the body. This piece also comes from a private collection in London. Finally, Maak's parallel auction, 'The Art of Sake' comprises a single-owner sale of Sake Ware from a highly regarded Parisian collection of Japanese ceramics, including this Oribe Guinomi Stoneware by Kouchi Hidetoshi. 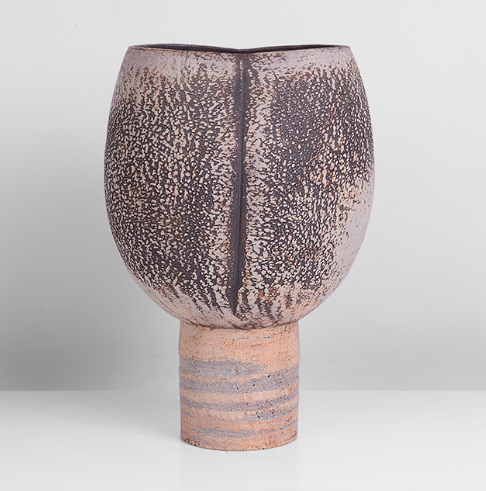 Other highlights of Maak’s sale includes works by Elizabeth Fritsch, Bernard Leach, Edmund de Waal, Gordon Baldwin, John Ward, Ewen Henderson and many more.